While it is gasoline that you put in your vehicle, there are numerous other liquids used by your vehicle to ensure it runs reliably. Each of these fluids are designed specifically for the job they do, and they need to be maintained at proper levels to ensure they're able to get it done. If you ever notice something leaking from your vehicle be sure to head to your local auto repair shop for proper diagnostics, and use this guide to inform the mechanic what you believe is leaking. Oil leaks are the most common automotive fluid leaks. Oil is integral to the operation of the engine, as insufficient levels will cause excess friction. Oil will generally appear as black or dark brown spots on the pavement, and in water it will create a rainbow sheen. If you can smell a sweet maple syrup scent coming from your vehicle, it is likely it is leaking coolant, also known as antifreeze. Often bright green in color, coolant is responsible for regulating the operating temperature of the motor. If you spot a reddish fluid leaking from the forward half of your vehicle, it is most likely transmission fluid. If you've got a transmission fluid leak you'll likely encounter grinding gears or delayed shifting issues as well. Differential fluid looks similar to transmission fluid, so the best way to tell them apart is by seeing where it is collecting. If it's in the back half of the vehicle, it's probably a differential leak. Brake systems use hydraulic force to stop the car. If the fluid in the system begins to leak you'll usually experience a soft or spongy brake pedal. You may notice the leak too, as it will be a slimy, clear-ish brown fluid leaking near the wheels or from the brake fluid reservoir area. Power steering fluid is essential to being able to properly control your car. If you hear a clicking noise as you turn or feel as if you need to pull hard on the wheel to get around a bend, it's likely your car is low on power steering fluid. If you ever notice a leak be sure to visit a shop for proper diagnostics as soon as possible, as running a car with low fluid will result in much bigger problems. 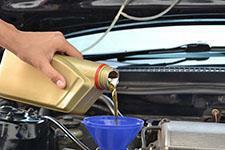 For automotive fluid leak repair in Covina head to Hye Tech Auto. Our expert auto repair technicians will quickly identify the source of the leak and have you on your way in no time. Give us a call at (626) 332-5452 to schedule superior auto repair in Covina today.